I cannot tell if this design is great or horrible - probably both! 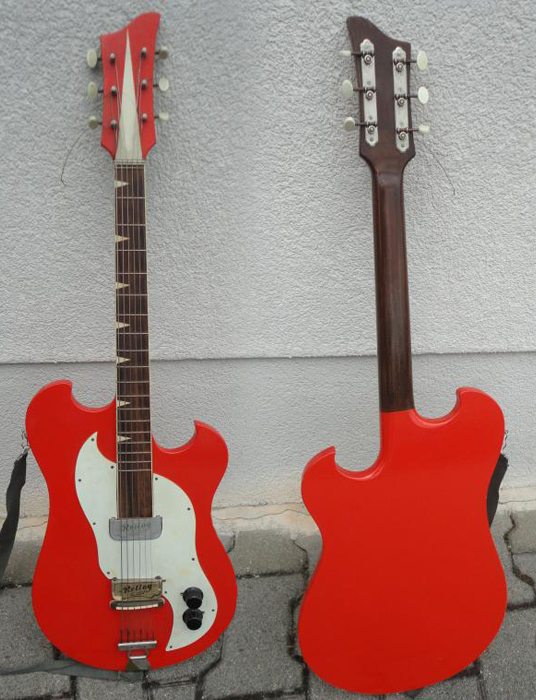 Rellog Gitona (Gitona stands for Gitarre Tonabnehmer - guitar pickup) was a Markneukirchen-based East-German brand, as was Herrnsdorf. Starting price of 199 Euros and currently no bids. Prolongated? There's room for suffleboard. The tuning keys are offset but not randomly, they work for the headstock. Without a pu selector switch are they both hot all the time or controlled by the knobs? When I look at so many of these earlier designs you could almost say they were "Pre-Townshend" or pre-Hendrix before designers had an inkling how hard they'd be abused.